Zetsche: Paid $11.5 million in 2011. 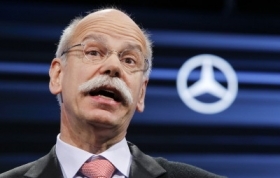 BERLIN -- Daimler has reduced the compensation of CEO Dieter Zetsche, despite posting record profit in 2011. Zetsche's renumeration for 2011 is currently calculated at 8.65 million euros ($11.5 million), including fixed salary, bonuses and long-term stock options, down from 8.69 million euros for 2010, Daimler said Wednesday in its annual report. Zetsche's base salary rose to 2.01 million euros from 1.53 million euros. The executive's compensation could increase if Daimler performs better than planned in the coming years. A bonus, which Daimler values at 2.04 million euros, will be paid next year and could fall or rise depending on the stock's performance compared with other auto companies. A stock-option program, valued at 2.57 million euros, will be disbursed in four years time based on how the company's earnings and shares fare. Daimler, which is also the world's largest maker of heavy-duty vehicles, reported record net income of 6.03 billion euros in 2011, 29 percent more than the previous year. Last year, Mercedes-Benz cars sold 1.26 million units, dropping behind Audi with 1.3 million and BMW with 1.38 million in overall luxury-car sales. The result prompted Zetsche to vow to retake the segment's top spot from the two rivals. Zetsche's contract with Daimler expires at the end of 2013 after the carmaker extended it by three years in February 2010. The highest-paid board member after Zetsche was Chief Financial Officer Bodo Uebber, whose total compensation was 3.68 million euros, down from 3.69 million euros for 2010. Pay for the entire management board, which was expanded to seven members last year with the addition of Christine Hohmann-Dennhardt to oversee legal and compliance issues, rose to 28 million euros in 2011 from 25 million euros a year earlier.